Villa 8 is a truly luxurious villa which offers 3 bedrooms, 3 en-suite bathrooms, a large living and dining area and a formal sitting room. The villa is furnished in contemporary Balinese style with large day beds, flow through breeze ways, and tropical gardens surrounding your sparkling infinity pool. 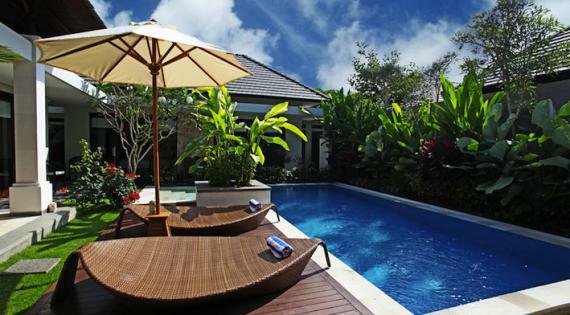 A gorgeous villa close to all Sanur’s restaurants, salons, supermarkets, boutiques and spas. Step out onto the beach side and sailing, surfing, snorkelling and skiing await. A long esplanade is great for cycling, jogging or taking a leisurely walk. Kejora Villas-Suites has 24/7 security at the main entrance and the beach entrance. Kejora Villas-Suites are situated on beachfront land in Sanur. Staying at Kejora Villas-Suites means you also get to enjoy the Kejora Beach Club located on the beach at the front of the villas. The esplanade, sparkling water and white sands of Sanur Beach are right on your doorstep. On the street entrance, you will find many first class restaurants, salons, boutiques and markets. The local businesses offer every water sport you can imagine and golf is just ten minutes away. Enjoy fresh seafood cooked on the barbeque and local Indonesian dishes made to order just for you. Early risers will see a stunning sunrise over Sanur Beach, bathing the sand and calm waters in a golden glow. The best beach location in Sanur!